Miss Tam Chiak first recommended Lao Ban on my radio programme as though this was the best thing she ever eaten in her life. She “fell in love” with Lao Ban since. So did the rest of Singapore. Old Airport Road Hawker Centre has become the new tau hway land, sprouting out 51 Soy Ban and QQ Soya Bean. 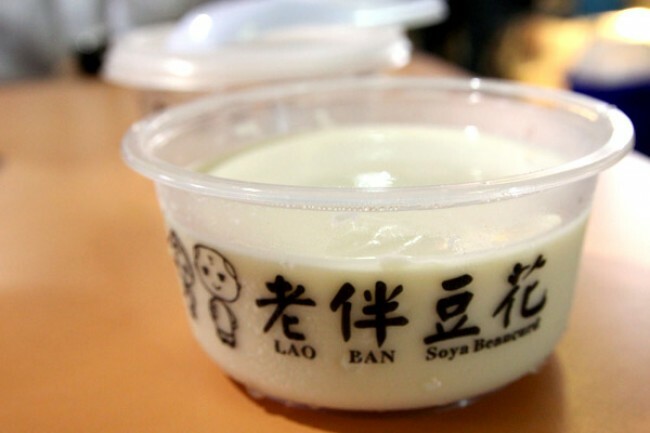 Lao Ban has the most accolades, with many fans claiming this is the BEST-EST tau hway ever. After queuing about 10 minutes, I got a bowl of the original ($1.50, almond for $2.00). ONE bowl. While the rest were buying 20 on average. Did they have that many family members, or they buying for the whole corridor/office/class? After my first mouthful, I must have exclaimed “OH MY GOD!” Yes, it was unreal. Yes, it was the best tau hway I ever eaten. No, it was not tau hway – it did not taste like all the rest, even the finest ones from Taiwan. I woke up from taste-slumberland to savour this texture that slipped down my throat into great satisfaction. This neither has the soya-beany taste, nor the sugar syrup. Instead Lao Ban’s version feels like some oriental crème brulee meets milk custard. Love it, or hate it. 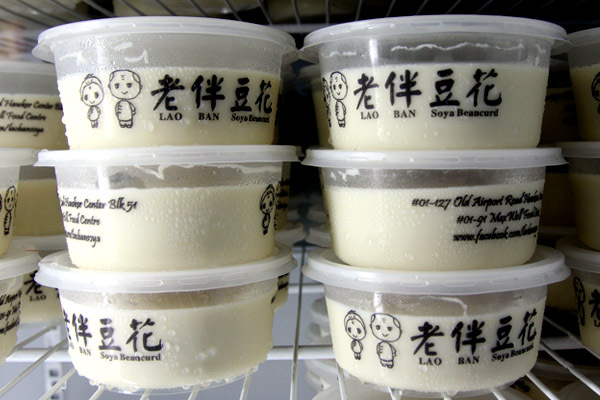 Set up by ‘Lao Bans’ husband and wife team Mr Li Hui Shing and Mdm Hui Ywai Kwai, their beancurd is freshly made on site. 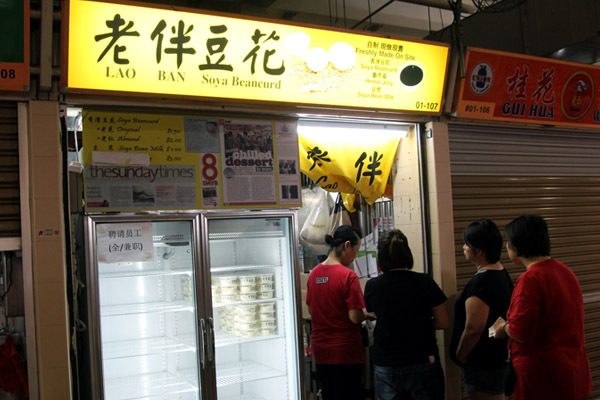 How many soya beancurd stall you know has a facebook page with more than 3000 likes? They already have its 2nd branch at Maxwell. With its present craze, this may become the next KOI bubbletea. Somebody tabao a bowl for me, please. 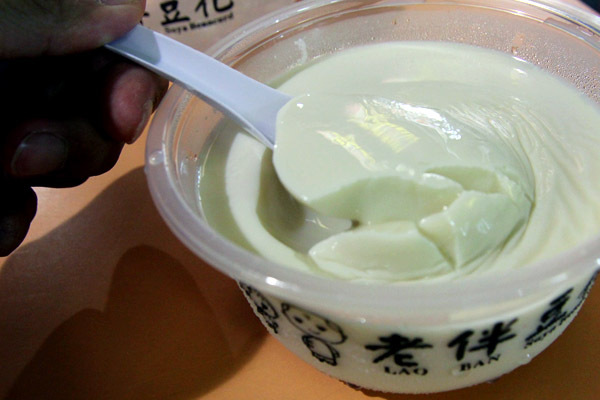 welcome to the beancurd craze! You are quite lucky that you queue just 10 minutes. I heard that there is an outlet in Maxwell selling chocolate, mocha flavours. Not sure if this is true. Yes yes, I am going next week to check it out. HAHA! WHY U ONLY BUY ONE BOWL! I was highly skeptical. I was wrong!